I’m the big tree-hugging tofu eater in our house. Hubby will eat it in a stir-fry, but only because he’s too lazy to pick it out. Sonny won’t touch it, no matter how I serve it (maybe I should try serving it with chocolate sauce??). 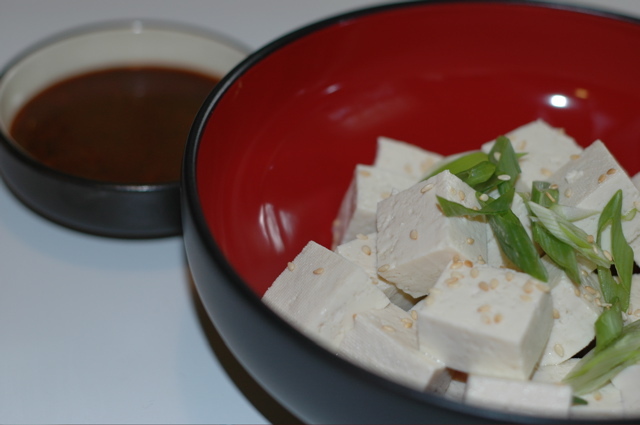 One of my favorite ways to eat tofu is fresh, with a nice dipping sauce and big bowl of Japanese sticky rice. My current favorite dipping sauce is a Korean one I first made here. It's so easy and as hubby pointed out, doesn't require any real cooking. Throw everything into a food processor, except the canola oil, lemon juice and salt. Process until you get a smooth paste. With the processor still going, slowing add the oil, until well incorporated. Add about ¾ of the lemon juice and salt and mix well. Taste and adjust seasoning with salt and lemon juice as necessary. Use as a dipping sauce for tofu (or grilled meats or anything else you’d like). This is my son’s favorite pasta dish because he loves sausage. Hubby and I like it because it’s got flavor. I use hot Italian sausage and I add a dash of red pepper flakes and freshly ground black pepper. 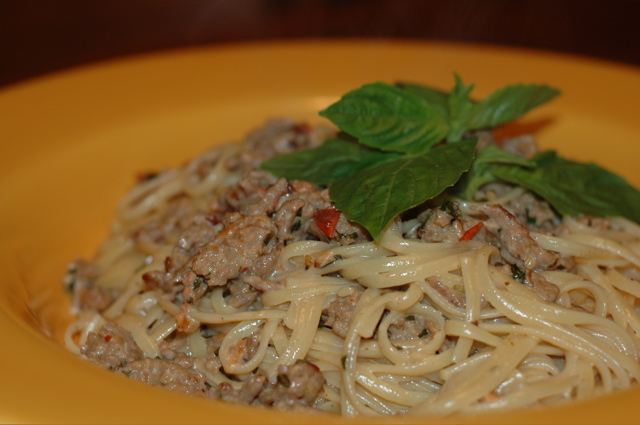 If you like a milder flavor, don’t add the pepper flakes and use sweet Italian sausage. Get the pasta water ready, but don’t add the pasta until you’re just about done with the sauce. In a skillet over medium-high heat, add about 1 tbs olive oil and the onions. Saute until the onions are soft. Add the sausage, garlic and red pepper flakes. Continue to sauté until the sausage is browned . Add the tomatoes and basil. Cook for about 4 or 5 more minutes. Add the cream and bring to a boil. The sauces should thicken slightly. Season with salt and pepper to taste. Turn off heat and let it sit until the pasta is ready. When the pasta is done, drain it and add the sauce. Toss well and you’re done. Serve with grated Parmesan and a nice salad. I really like that motto because it reminds me of the friends I've made here. You'd have to be a little strange to think it is perfectly normal to raise chickens in the middle of a bustling city. I barely need two hands to count my friends and five of the fingers represent people with pet chickens. When the ladies get together, the conversation can easily jump from parenting to relationships to chicken coops. Of course, the good thing about raising chickens is having fresh eggs. I could get eggs from my friends, but it's more convenient to buy fresh eggs from hubby's coworker, who has a small farm a few miles outside the city. 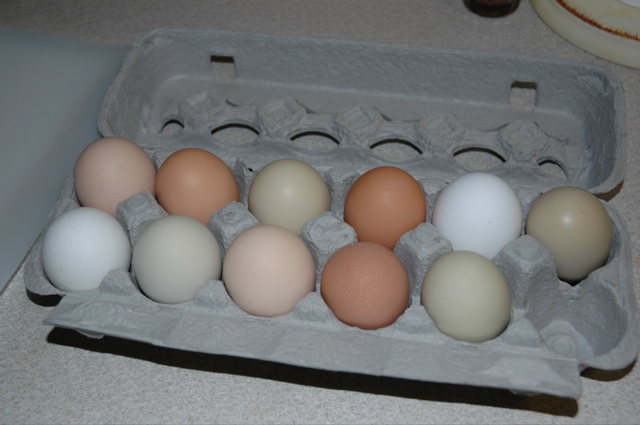 Every week we give him an empty carton and $1.50, and in return he gives us a dozen multicolored eggs. Some are greenish, some white. Most are some shade of brown. Their yolks are orange rather than pale yellow, and they are delicious. But at first, I was scared of them, especially the green ones. What if I cracked one open to find something horrifying? Luckily, I've only gotten one dud, and it wouldn't even crack open. I threw it away before telling hubby because I was afraid he'd want to crack it open with a hammer to see what was inside. To get fresh eggs, you could get your own chickens (if you're city even allows them), or you could try finding a vendor at your local farmer's market. In a large bowl, combine the curry paste with the oyster sauce, lime juice and fish sauce. Mix it well, making sure to break up any clumps. The result should resemble miso paste. Add the eggs and beat them very well, until they are frothy. Make sure the curry mixture is uniformly distributed, otherwise you may get an unpleasantly strong bite of curry in your mouth. Add the green onions, cilantro and green beans and beat a little more. 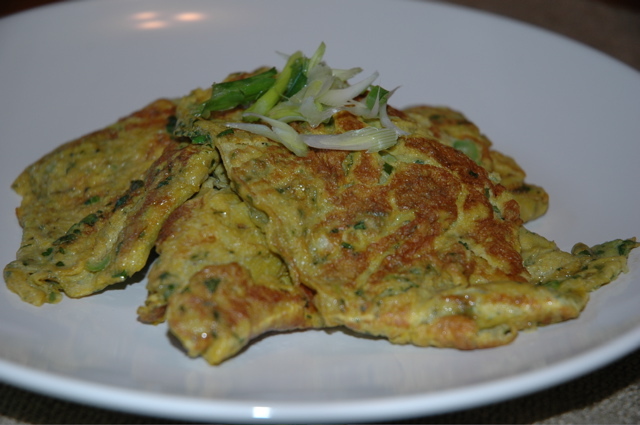 I like to cook this type of omelet in a wok, but a skillet works too (if you use a skillet, cook it like a frittata: start in the skillet and finish in the oven). Add about 2 tbs oil to the wok and push it up to coat the sides. When the oil is really hot, add the egg mixture right in the center of the oil. The eggs will expand and push the oil up the side a bit. As the eggs are cooking, lift the mass to allow uncooked egg to flow underneath. I normally turn the omelet (it always breaks) to fully cook both sides, but if you are more traditional, you can try to fold it on itself and let it finish cooking. Or you could be a real rebel and just scramble them. I like serving eggs with steamed jasmine rice or Thai sticky rice with sambal oelek and soy sauce for dipping. In Too Much of a Hurry to Make Curry? Ya'll know I'm a big stir-frier. It's the fastest type of food I know how to make and requires little more than an onion and meat (or tofu). Of course, I like to spruce it up and curry pastes do just that. In a small bowl, combine the curry paste, fish sauce, sugar and lime leaves. Mix well and set aside. In a very hot wok over high heat, add 1-2 tbs oil. Add the curry mixture and garlic and fry for about 20-30 seconds. Don't let it burn. Hopefully your wok is well seasoned so it won't stick either. 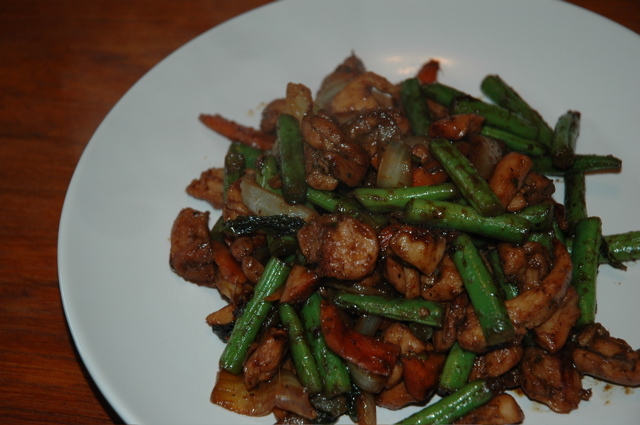 Add the vegetables and stir-fry for about 2-3 minutes, tossing well to insure the veggies are coated with curry sauce. Add the chicken and continue to stir-fry for about 2 minutes. Add the oyster sauce, basil and 2 tbs water. Stir-fry until the chicken is done. Adjust seasonings with fish sauce, if necessary. Serve with steamed jasmine rice. This dish reminds me of the classic Thai stir-fried pork with Chinese green beans, which is made with red curry paste and no basil. Different options include using other veggies (baby corn, asparagus, green onions), substituting 1 stalk lemon grass (whites only, finely sliced) for the kaffir lime leaves, or adding fresh chopped ginger. 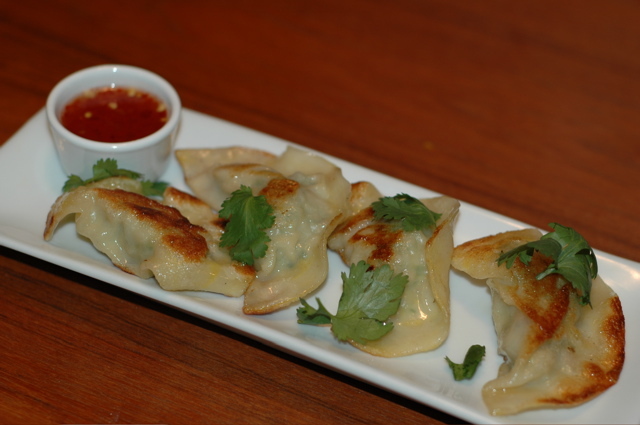 Potstickers, goyoza (gyoza), pan-fried dumplings…whatever you want to call them, I love them all. I just don’t love making them. The filling is easy enough to throw together, but wrapping is sooo tedious. The one good thing is I can make a gazillion in one sitting and freeze them. Mix all the filling ingredients in a large bowl. Spoon about 2 tsp filling into each wrapper, brush the edges with egg wash, and fold into half moons (or triangles if you have square wrappers). There’s a few different ways to cook these bad boys. Do it any way you like. Here’s how I do it. Bring a large pot of water to boil. Add the goyoza and boil them for about 3- 4 minutes. Drain and toss them IMMEDIATELY with a little oil. At this point, you can freeze the ones you aren’t planning on eating. Put them in a single layer on a lined cookie sheet and stick them in the freezer. When frozen, they can be thrown into a Ziplock bag. Oh, and take care not to drop them all over the dusty basement floor as you pull them out of the freezer. In a skillet over medium-high heat, add a thin layer of oil and then the goyoza. Fry until a crust forms on each side. Serve with soy dipping sauce or sweet chili dipping sauce. In a small saucepan, bring the sugar, water and rice vinegar to a boil. Reduce the heat a little and simmer for about 5 minutes or until it starts to get a little thick. Turn off the heat, add the fish sauce and sambal oelek. Cool to room temperature before serving. We usually spend sonny’s birthday at Grandma’s house, where we celebrate his, hubby and Grandma’s b-day in one go. But this year he wanted a real party at the park with pizza, cake and all his friends around. Sounds like a no-brainer, right? Ha! On the day we handed out sonny’s invitations at daycare, another group (three kids, one big party) handed out their own, and there was a slight overlap in party times. For us, this was no problem but the other parents were a bit annoyed because this was supposed to be the last birthday these kids would spend together before going to different schools in the fall. But still, we saw no reason to change the date, and we didn’t expect them to either. Needless to say, there was a little awkwardness at daycare for a couple of weeks. This morning, I sent hubby to put signs on the picnic tables in the area we reserved. He came back telling me the park was currently under construction. Yes, Portland Parks and Recreation decided the best time to renovate a park was during the start of park season, and they failed to tell us they had torn out all the play structures when we made our reservations 3 weeks prior. Hubby and I are kicking ourselves for not driving by the park sooner. To top it off, there were drunks laid out on the picnic tables (at 9 in the morning). I almost cried. In my frazzled state, I forgot to pack a cake knife, salad fixings, butcher paper to cover the picnic tables, and a CAMERA. I have to thank my peeps for helping me out. Megan, you are an awesome baker and everyone loved the cake and cupcakes (click here to see the original recipe). I originally planned to purchase a cake, but now I’m so glad you volunteered to bake one (a double layer, no less, and about 60 cupcakes). Brian, Susie, Liz, Michael, Chris and Lise, thank you for the moral support and for helping keep the party running smoothly and cleaning up. Thanks to everyone who came and made it a special day for sonny. Oh, and thanks Pizza Schmizza for opening early and getting our pizzas ready on time.